How many of you can honestly say that you know what your parents’ needs and wishes are as they continue to age? How many of you do not know how to even start that discussion? We’ll cover this important topic on Day Three of the 30 Day Preparation Plan To Care For An Aging Parent. Welcome to the Raising ‘Rents Podcast. This show is sponsored by ComForCare, a national home care provider that will help you live your best life possible. Day Three of the 30 Day Preparation Plan is the next step in preparing a plan to become a caregiver. Please be sure to listen to the previous steps for a full picture of what this plan should look like. Keep in mind as we go through this process, our primary goal for family caregiving, regardless of circumstances, is to provide a loved one with a comfortable, caring environment in which to grow old. On Day One, we talked about how the first step is all about Y.O.U. 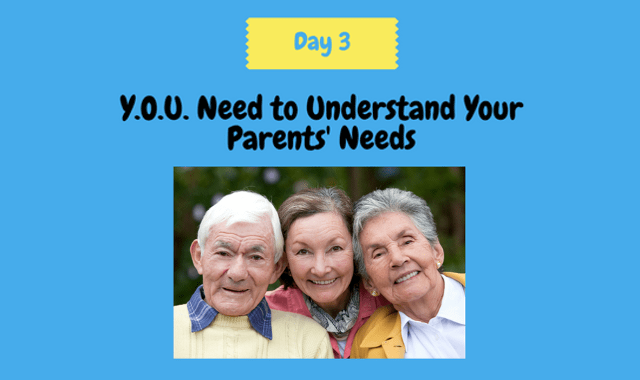 – “Y” is for Your well-being, “O” is for Overall financial situation, yours and your parents, and “U” is Understanding your parents’ needs, which we are talking about today. There are three ways that I can think of to get a good understanding of your parents or any aging adult’s wishes and needs as they age. By the way, what I mean by their wishes and needs are things like…do they plan to remain in their home for the rest of their lives, are they open to downsizing and going to a senior community, do they have legal documents in place assigning someone to help them with fiduciary and health decisions – if they can’t, have they made advanced directives on how they want to be treated if it came down to life and death situations, have they planned for long term care expenses, how do they want to get around if they no longer can drive a vehicle, etc etc. One way is to research it—there are so many articles about aging all over the internet—blogs, newsletters, websites, tweets, etc etc. There are associations dedicated to specific chronic illnesses like arthritis, Alzheimer’s, and Parkinson’s. There is no excuse really to not know or have some idea of what your parents may go through as they get older and what they might need. The only challenges you have is finding the time to research and determining what is accurate and what is fake. The second way is to talk to someone who is going through it. Every time I have mentioned to someone that I have a podcast about caring for aging parents, I get a personal story from them or a story about a relative, coworker, or friend that is a caregiver for an aging adult. I mean it…every time. So, talking to someone who has had to hire a home health care agency, or move a parent to a long term care community like an assisted living or nursing home, or had a parent who has fallen recently….is very valuable. You can learn from their mistakes. You can pick up tips. You can feel a little better that you are not going through this alone. Trust me, you are not. We get at least one phone call a week into our home care agency from someone who is going through it. By the way, I got into the home care business because I failed at these two first steps. When my mother needed help to care for my father, I was clueless, called my Employee Assistance Program at work, and hired the first agency I spoke to without any research or talking to anyone who has gone through it. My mother fired them after the second day and candidly, so did I after I was unable to reach them for some of the issues we were having. My dad died six years ago this month. Shortly after his passing, I started telling Mom that she may have to consider moving out of the good sized ranch she is living in all by herself. She did not want anything to do with that. She would get angry just by my mentioning it. Over time, she has softened up. In fact, on her last visit here in New Jersey, we talked about it and had a very good conversation on considering some options and how she would like to look at some places. Imagine if I had this conversation when Dad was still around. Perhaps he would have shared some of his wishes, like he did not want Mom to stay alone in their home if he was to pass away. Kind of giving her permission to consider it earlier than later…. though she still needed to go through her grieving period, she may have come to the conclusion sooner know it was something he wanted. Sometimes, again, depending on your relationship and how many baby steps you’ve taken, a more direct route is best such as “Have you thought about what you would do if one of you God forbid were to get really sick?”. Saying “if one of you die” is a little too strong and personally, I would get turned off by it. But you’ll get there. And baby steps. There is a lot to talk about when it comes to aging, whether it is remaining at home, downsizing, or having options for a long term care community. You have to have these conversations so you can know what they wish to do when those decisions need to be made, what they wish for and what some options are. You have to prepare for that in advance. Will the home be able to meet their needs—live on first floor if going up the stairs will be difficult? Put in a stair lift? Ramps? Grab bars? Enter a shower without going climbing into a tub? How would you go about selling the home? Moving your possessions? Decreasing your possessions? Discuss all the types of options, what they are for, what they cost. What would each of them want for the other if they were alone. What you will discover as you talk about these things is what is important to them, what they wish for and what they need. For example, you will learn what they really would miss about home if they had to move. Things like favorite possessions like dad’s chair or mom’s favorite room in the house, their privacy and space, their yard and garden, …these things feel like home and are important to them. Be sure to exercise your listening mode—take mental notes and do not try to persuade them to think otherwise. Way too early for that! Something that is not too early to talk about but very uncomfortable is advance directives. Phyllis and I are 55 years old and we sat down with a lawyer and had our advanced directives drawn up a few years ago. God forbid something happens to us and we cannot answer for ourselves, we need our children to know our wishes. Most of our parents have wills that they probably drew up years ago with a family lawyer. But the legal documents needed today are much more complex and usually an elder care attorney is the best professional to assist with these. Either way, advanced directives are important that they are documented and individuals identified as their representatives in either fiduciary or health decisions. We will discuss all of this in a future episode. So that’s Day 3. I hope it was helpful. Join me for Day 4 when we talk visiting mom and dad and what you should look out for as a prep plan for aging in place. Thank you for listening to the Raising ‘Rents podcast. This was Episode 12. If you have any questions or feedback, please go to our website www.raisingrents.com and click on the “Contact” tab. You can also find the show notes and references to anything we talked about. Until we talk again, remember that our parents raised us, the least we can do is help raise them. Talk to you later.